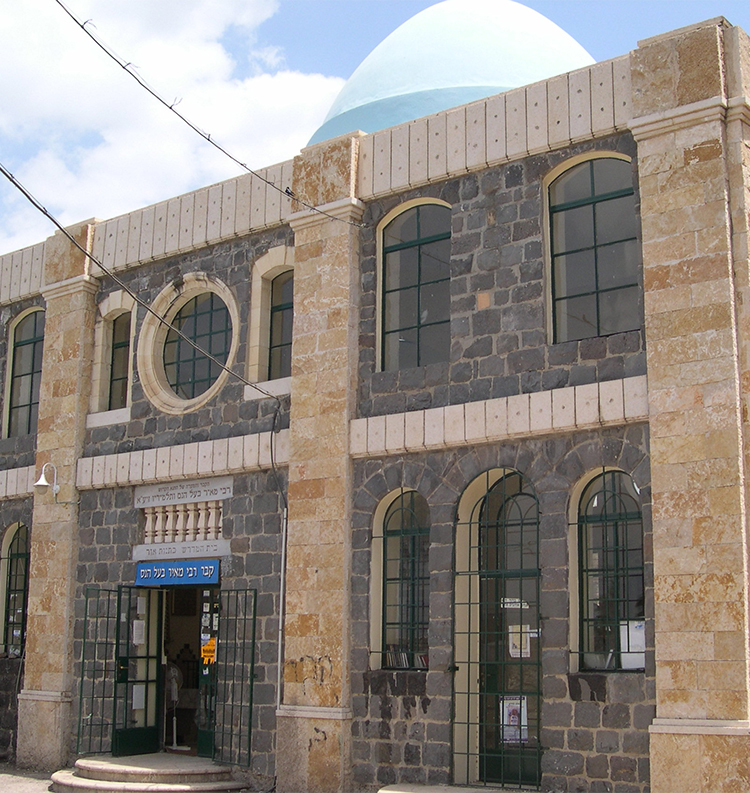 Among the world's most illustrious charities, Kollel Shomrei Hachomos of Reb Meir Baal Haness was established in 1852 by disciples of the saintly Chasam Sofer zt"l. With a total annual budget of over $16 million, the Kollel today is essentially a conglomerate of more than 20 different charity organizations all operating out of a single institutional framework. 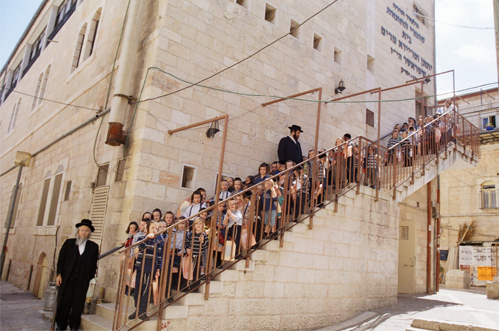 Serving as the virtual lifeline for thousands of impoverished families in the Holy Land, the Kollel provides financial relief and resources for every lifecycle event. 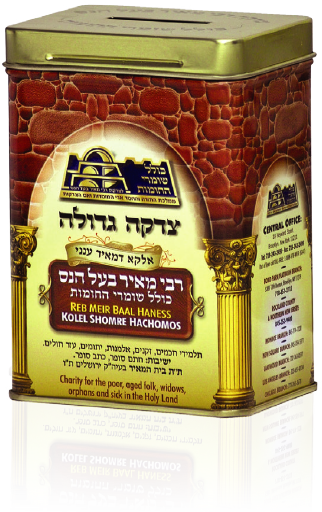 The seniority and preeminence of the Reb Meir Baal Haness charity is a time-honored tradition in Klal Yisroel, handed down from father to son. The cherished stature of this tzeddakah continues today with the very same reverence and veneration as it did in the old country more than 150 years ago. The cherished stature of this tzeddakah continues today with the very same reverence and veneration as it did in the old country more than 150 years ago. While small waves of European emigration to Eretz Yisroel began as early as the 1760's, the Chasam Sofer zt"l, in the early 1800's, was the first to advocate specifically for the resettlement and rejuvenation of Jerusalem. The earlier groups, known as the Perushim and Chassidim, settled primarily in the Galil region on the ancient ruins of Tzefas (Safed) and Teveria (Tiberias). There are various reasons given for the early groups choosing to settle in the Galil rather than Yerushalayim. One factor may have been the difficult and sometimes treacherous living conditions in the undeveloped Yerushalayim region, which was inhabited almost exclusively by uncouth and primitive Arab tribes. In the 1830's, the Chasam Sofer sent his first group of disciples, vibrant and determined young men and their families, with the specific goal of resettling Yerushalayim. This distinguished group and the many that followed shortly thereafter included some of Austria-Hungary's most distinguished talmidei chachomim, namely Harav Avraham Shag zt"l and Harav Yosef Chaim Sonnenfeld zt"l, who went on to become the founding leaders of the Ashkenazi Yishuv in Eretz Yisroel. 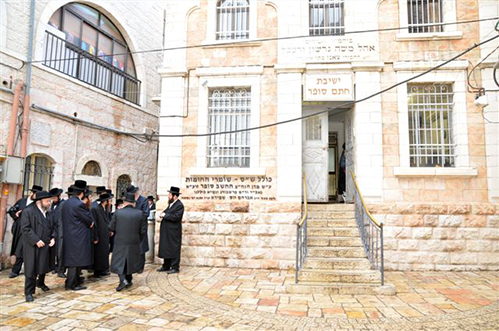 In keeping with its mission, Kollel Shomrei Hachomos, Reb Meir Baal Haness was the first to build large-scale free housing units outside the Old City walls. The famous Batei Ungarin complex, with its hundreds of rent-free apartments, provided the nucleus for the development of today's bustling Meah She'arim neighborhood. Kollel Shomrei Hachomos was established by a conference of over 200 leading rabbonim (rabbis) representing every spectrum of Austro-Hungarian Jewry. Throughout the generations, it remained under the personal guidance and management of the most venerable and distinguished rabbinic leaders of the time. They defined the concept of Reb Meir Baal Haness not as a charity, but rather a vehicle for partnership. It facilitated the joint mission of those who were actively resettling the Holy Land, sacrificing a life of comfort and stability to dwell in the Divine abode, and their brothers and sisters back home, who would take their share in this holy mission by providing the vital support and wherewithal for the endeavor. They defined the concept of Reb meir baal haness not as a charity, but rather a vehicle for partnership. Thousands of extended families today trace their roots to the valiant pioneers of Kollel Shomrei Hachomos, whose resolute determination planted the first seeds of rejuvenation for the beautiful renaissance of today's Yishuv. We, the generations of supporters of the Kollel, can be equally proud of our own parents and grandparents whose enthusiastic support of Reb Meir Baal Haness provided the wherewithal for this supernatural development, despite the overwhelming odds. The concept of Reb Meir Baal Haness dates back to the very first settlers of Eretz Yisroel in the 1500's. The great mekubalim (kabbalists) of Sephardic Jewry, among them the holy Bais Yosef and the Alshich, ascribed the merit of the holy Tanna, Reb Meir, exclusively to those who support the resettlement of Eretz Yisroel. The Gemara in Avoda Zara relates a fascinating episode, where the great Tanna (sage of the Mishna), Reb Meir, revealed a secret formula for miraculous salvation. As a reward for someone who had done him a personal favor, Reb Meir shared with him that should he ever be faced by any danger he should recite the words "Elaka D'Meir Anaini" – The G-d of Reb Meir please answer me – and he will miraculously be saved. The Gemara goes on to reveal a series of miraculous events invoked by the recital of "Elaka D'Meir Anaini" – hence the name Reb Meir Baal Haness. The support of resettling Eretz Yisroel in the merit of the holy Tanna, Reb Meir, was classified by these eminent mekubalim as the ultimate zechus for his neshama, which would earn the contributor the supernatural power of the words "Elaka D'Meir Anaini" as outlined in the Gemara serving as source for yeshua (salvation) in all areas of life, business, family, health or when going through a crisis of any kind. To this day, the Pushka remains a foremost pillar of Jewish tradition. Jews throughout the generations knew and cherished this time-honored, proven segula (merit). Indeed, the ubiquitous little Reb Meir Pushka became a fixture in every Jewish home, in the synagogue and in the place of business. Before prayers, before candle lighting, or before departing on a journey, Jewish mothers and fathers could be seen with their hands over the charity box, reciting a tearful payer for success and blessing. Thousands upon thousands of miraculous stories and anecdotes have been recorded and handed down from father to son. To this day, the Pushka remains a foremost pillar of Jewish tradition. Kollel Shomrei Hachomos today consists of a myriad network of charitable projects and initiatives, with a mammoth annual budget that exceeds $13 million! In addition, more than $8 million each year is loaned to struggling families through the Kollel's Gemach Free-Loan Society. 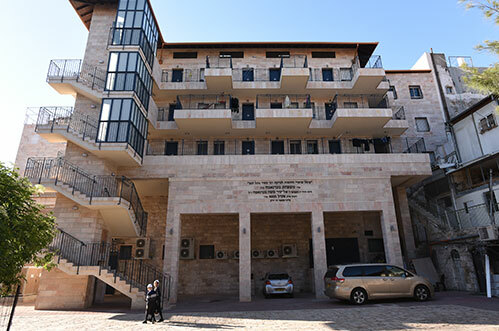 The multifaceted programs under the auspices of Kollel Shomrei Hachomos cover every facet of Jewish life, including a vast school network, specialty institutes for advanced learning, housing, medical aid, widows and orphans funds, food distributions bridal funds, and more.